UNIT: Dominion was probably a first for Big Finish, four one hour episodes that all followed one storyline. Zagreus and The Next Life came close to doing this and there have been other boxsets but Dominion is a big story, told in one big release. Dominion reunites the Seventh Doctor, nearing his regeneration with Elisabeth Klein - everyone's favourite not-a-nazi, who had appeared in Colditz, A Thousand Tiny Wings, Survival of the Fittest and The Archetects of History. It also gives us another story with Raine and even another Doctor. The biggest worry I had about Dominion was always going to be the ending. Written by Nicholas Briggs, he has a way of getting the Doctor caught up in gigantic events that are so big he can't see a way out of it. Sometimes these types of story work, Sword of Orion and Patient Zero are good examples but sometimes, they come across unsatisfactory when Briggs wants the Doctor to win. Blue Forgotten Planet and The Vengeance of Morbius are resolved the former with a technobabble explaination about a time loop and the latter, Time Lords intervening in a way they had never done before because it would make Doctor Who very, very, dull. So just how was Briggs and co-writer Jason Arnopp going to be able to bring a story like this to an end? Well, before you look at the end, you need to look at the story first. In its beginning, Dominion follows the story across two plots. 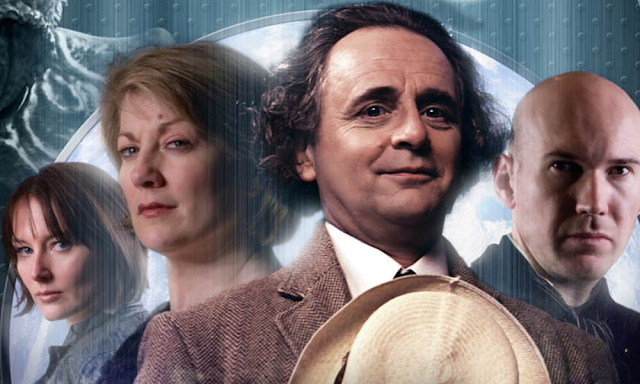 The first explores the Seventh Doctor and Raine and the second explores, Klein, UNIT and another Doctor intercepting stranges events unfolding on Earth. The Raine plot feels murderously under-developed, a large segment of it taking place in a trans-dimensional tunnel or something and although actress Beth Chalmers gives it her all, it does seem like Raine will never be blessed with good writing. She is witty and intellegent but nothing ever really happens beyond her spending most her time sarcastically expressing her ignorance. With Dominion being released in 2012, surely we had already reached the point where companions could be written properly? The second plot more than makes up for it though. Klein, now working for UNIT as their scientific advisor under Colonel Lafayette, when the Doctor shows up. But this Doctor isn't the same one who has been shadowing her all of her life. Tracey Childs' Klein has always been a delight and she is no exception in this tale. The old Klein was a Nazi from an alternative timeline. But this Klein has never had those experiences but is still the smartest person in any room and she knows it. The teamwork that gradually builds itself up between her and the other Doctor is brilliant. In fact, if it wasn't for Tracey Childs, then Alex MacQueen would have stolen the show as the 'Other' Doctor. He is boisterous and energetic and feels very much in same mould as David Tennant and Matt Smith's incarnations. He is great fun when he needs to be and terrifying when it is called for. Of course, we all now know who MacQueen's 'Other' Doctor turned out to be but it is a shame that we never heard anymore of his as the Doctor before his revelation. This set is accompanied with some brilliant sound and music design from Martin Johnson, who really gives this set an epic quality. Unfortunately, Dominion didn't really need to be Big Finish's longest running story as all the alien incursions end up being a little repetative. One would have carried us through the story exactly the same, I think and the rest of the time could have been spent making UNIT feel a little more interesting. Sam Clemens is good as Major Wyland-Jones but if any of the other characters felt distinctive, it was usually in a bad way. And if Big Finish ever think about doing a follow-up to this story, Sergant Wilson had better not mention his wife or child, ever. And as for the ending, it was sudden, which didn't surprise me in the slightest but it does mostly work.